No, this is not Guido's and my body weight combined. 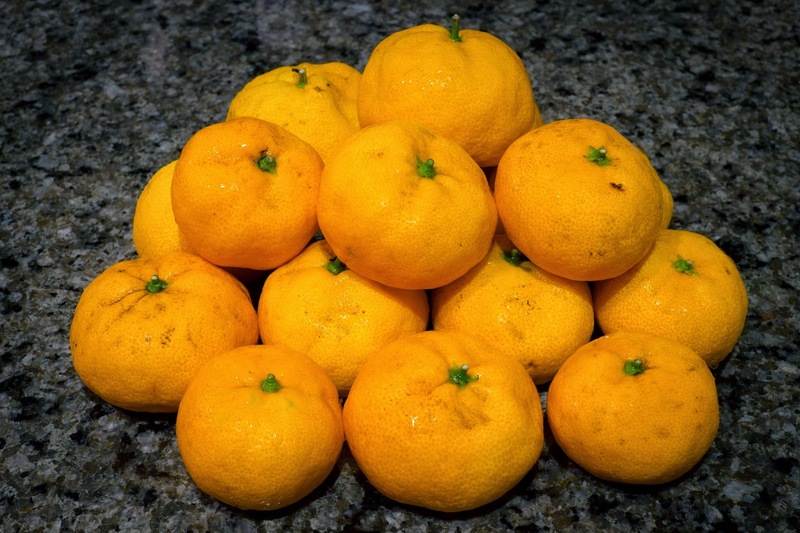 It is the amount of fruit that our citrus tree presented us with this season. The tree had been planted by the former owner of the house. Therefore, we don't know exactly what kind of mandarine variety it is - maybe tangerines or mandarine oranges? They are easy to peal, seedless and juicy with a well-balanced taste. 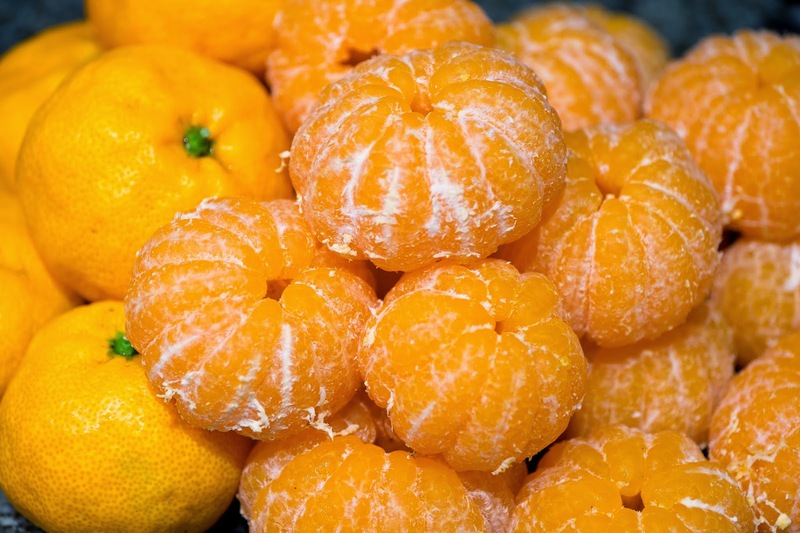 For simplicity, let's call them mandarines. We are very thankful for the tree's productivity and since we don't want to waste any of these yummy mandarines and do share only involuntarily with the squirrels, what do we do with 187 kilos? Choice #1 and most obvious: eating as many as possible for the last few weeks. Choice #2: Sharing the delight with friends, family and co-workers. And another great option: marmalade! The German cooking website www.chefkoch.de provided me with the original idea and since then I experimented with various additional ingredients. I had best gelling results with Dr. Oetker Gelfix Super 3:1 which I either import from Germany or order through Amazon. Two packages (50 gram) of the 3:1 product make a fruity and less sugary marmalade and require 2 kilo of fruit, plus 700 gram of sugar. 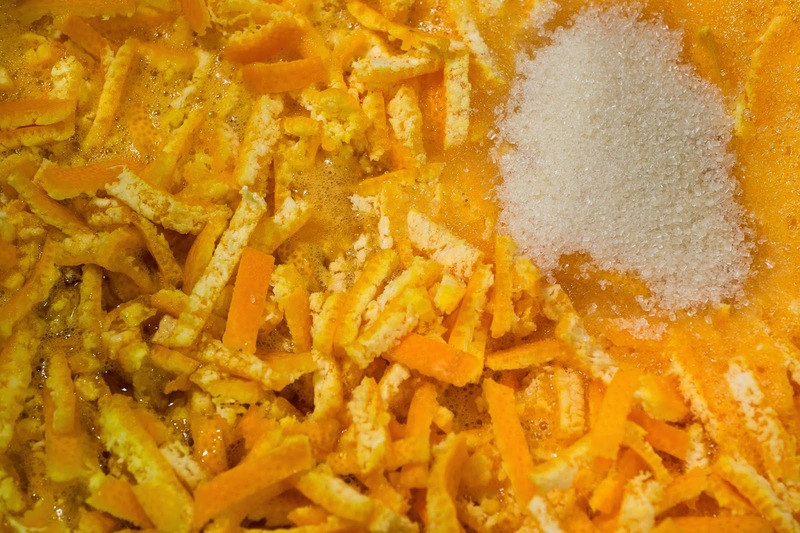 An important ingredient of the marmalade is the mandarine peel. 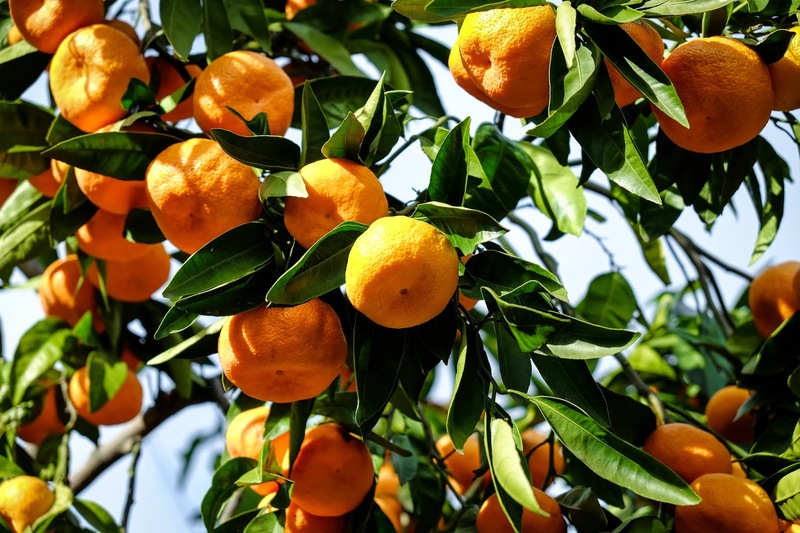 As our mandarines are grown organic, no need to worry about pesticides even on the peel. Half of the mandarines are washed, peeled and the peel cut in smaller pieces while the other half gets peeled and the peel goes to compost. Adding 100ml of orange liqueur is one nice variation of the recipe. 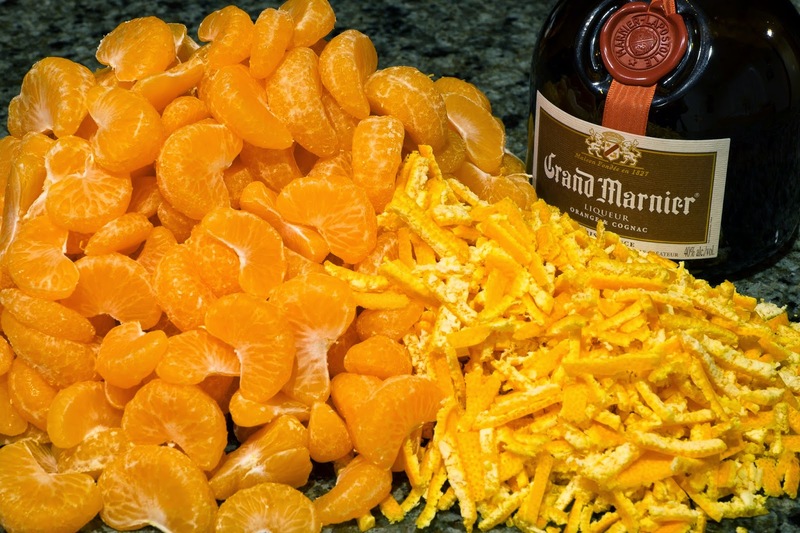 Instead of orange liqueur, Campari is another option which slightly intensifies the typical bitter taste of the marmalade and adds to its beautiful orange color. 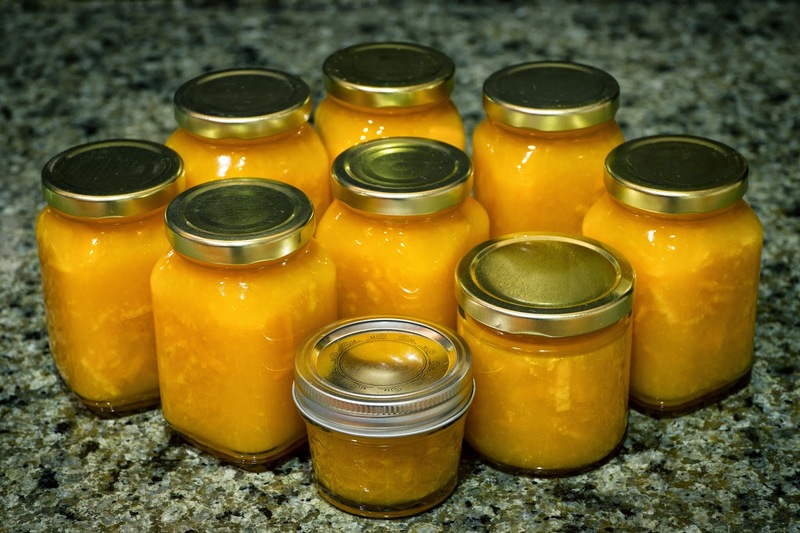 Thanks to the gelling powder the pureed fruit and sliced peel requires a cooking time of only 3-4 minutes and can then be distributed into jars which were sterilized in the oven at 100 deg C.
I couldn't imagine having a mandarin tree in the yard, my favorite of the citrus family. Thanks Brandy! I must say that the tree was one of the selling points for me when we first saw the house. Having grown up in Germany where it is too cold for citrus trees (except in large pots which get moved inside for winter) it is really fantastic to have our own mandarines. Yummy! And a nice present for Christmas and on other occasions. Very true. The only downside of bringing marmalade to Europe is that the TSA always seems to suspect that the jars are explosives and screen/open my suitcase. Ok, they are simply doing they job but nevertheless it's kind of irritating. That is so awesome! I like your ideas around your mandarines. Well done, Andrea. And, of course, good job mandarine tree. Impressive! I've made marmalade once before and discovered that most family members wouldn't even try it. Very discouraging (to me). It looks like you have a nice, productive tree. Thank you! Actually, making marmalade is really easy, especially with the German gelling powder which asks for an amount of fruit in gram or kilo. The products I have found here so far only give you an amount in # of fruit, baskets or cups. And more than once the marmalade did not gel properly. Very annoying. What did you use? The sun is out. And so am I. What a nice time of the year!